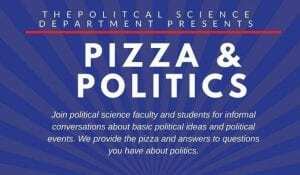 The Department has also started a new “Pizza and Politics” Discussion. The next one is scheduled for Tuesday, November 13th from 6:00 PM-7:00 PM. The topic is: “After the 2018 Midterms: What Happens Now?” Hosted by Dr. Bill Hudson and Dr. Adam Myers.